It is situated on the edge of a permanent lagoon with the Chindeni Hills as a magnificent backdrop. 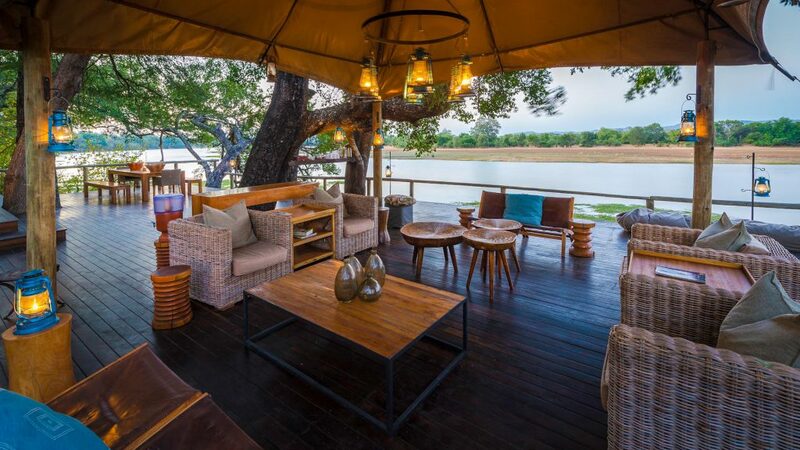 Raised on wooden decking, the 4 en-suite luxury tents have private decks from which you can view the resident big game or simply enjoy the serenity of the lagoon.Each tent has 2 queen-sized beds, hot and cold running water, shower, toilet, double vanities and polished floors. As a sister camp to Bilimungwe, it has an altogether different theme and character. The camp nestles on the apex of a permanent oxbow lagoon, offset by the magnificent Nchendeni Hills. This is the ideal spot for both the avid and intrepid Game spotter as well as the more sedentary visitors who wish to observe nature at its best without too much personal effort. The lush and wide permanent lagoon which stretches out from just beneath your own private balcony ensures that you need make little effort as you lazily watch all types of game parade before you in the joys of the verdant pantry at your feet. 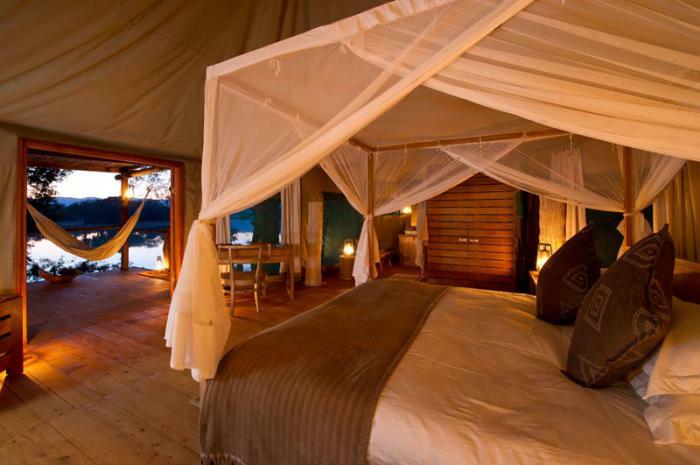 Raised on wooden decking, Chindeni’s four en-suite tents provide the same luxury features as Bilimungwe. 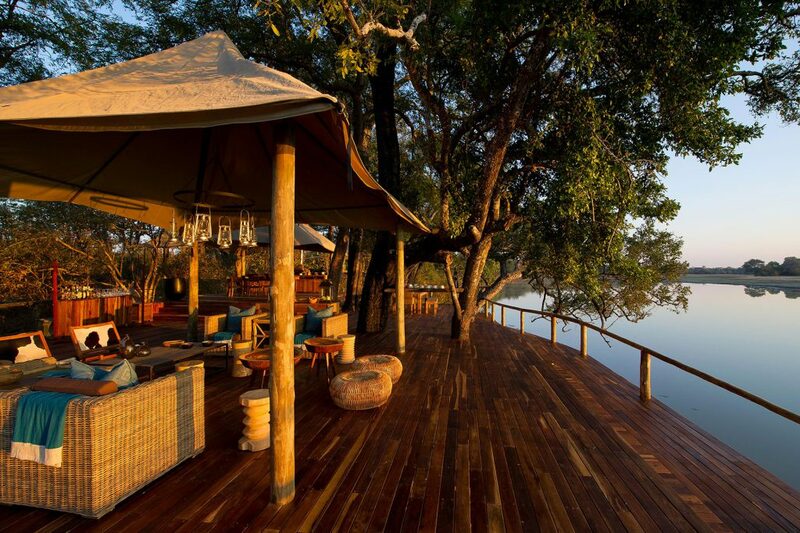 Each tent has its own raised veranda from which to view the resident game and enjoy the serene yet breathtaking tranquility of the vast lagoon, from a vantage point of relative safety. Chindeni is built underneath a shady grove of ebony trees overlooking Chayumba Lagoon, a large and productive oxbow lake that is often teeming with wildlife, with the towering Chindeni hills as an impressive backdrop. The shared area consists of a sturdy split-level deck overlooking this lagoon, with the upper tier shaded by a suspended canvas roof. Under this there’s a large pine table where guests dine communally for lunch and dinner, although meals can also be taken on the lower level, out under the sky. The lower level also houses a lounge with low wicker armchairs, and deckchairs made from cow-hide. Dotted around are a variety of handmade side tables and stools, hand-blown glass vases and brass bowls. Though none of this matches as such, all are very stylish and simple, so work together really well.